Innovative ideas for directing a successful music ensemble. Join world-renowned composer, arranger, teacher, judge, and clinician Richard Saucedo as he guides you through a system of teaching music fundamentals that has earned acclaim and success at both the state and national levels. 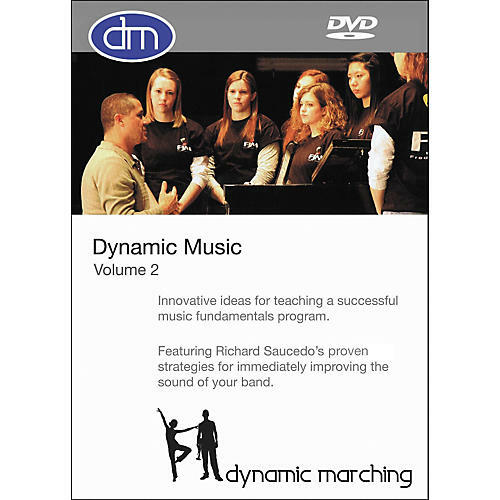 Building upon the national success of Dynamic Music: Volume 1, Volume 2 of this Hal Leonard series continues to focus on clear and proven teaching methods for helping your band or choir achieve sonorous excellence both indoors and outdoors. Volume 2 of this excellent teaching tool focuses on the basics of phrasing, articulation studies, and rehearsal skills, while also concentrating on the challenges of balancing the ensemble outside, volume techniques for outdoors, hierarchy of parts, timing, and ensemble listening skills. This teaching system is built upon Richard Saucedo's years of award-winning experience helping musical ensembles to achieve wonderful, rich, sonorous sounds and isn't limited to the marching band genre.